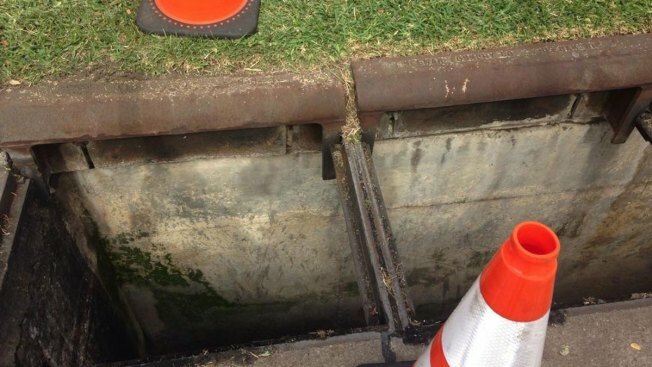 More than 15 storm drain grates are missing in Fort Worth, causing dangerous holes in some streets. City officials believe thieves are stealing the grates and selling them as scrap metal. According to Storm Water Management, barriers have been placed around the holes at several different locations, warning people about the hazards. “It is a five-foot hole that if somebody is not paying attention, they can fall into,” said Juan Cadena, superintendent of Storm Water Field Operations near one of the locations. For people who live near the affected streets, it is quite a headache. Avery McGrath rides his bike to Texas Christian University, and says the first time he came across the barriers, he almost fell in the hole. “It gets scary, especially when I am riding behind cars. I have to swerve in,” said McGrath. “For drivers, of course, it’s terrible, but for kids, as well dogs, pets. People are crazy. They will do anything for a quick buck,” said Marilyn McGee, who also lives nearby. This is not a cheap problem to fix. Each grate costs about $500, and it take between six and eight weeks to manufacture them. Fort Worth police officers are investigating.